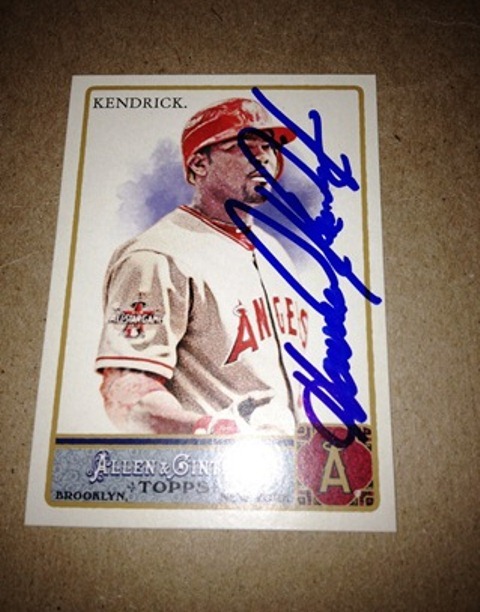 I got this card signed in-person during the last Angels homestand - Kendrick has been a pretty good signer before Angels home games, though depending on the crowd lined up along the rail, he might not be able to sign for everyone. My best guess was Young was in his own world, probably inebriated - a panhandler was cloying around his space, unsavory, un-PC things get said when people are under the influence and things happen. When bystanders try to break things up, he gets in a bigger altercation that gets him arrested. Maybe lost in the message is that Delmon can be the most laid back, chill guy under most circumstances - but he's no Josh Hamilton. 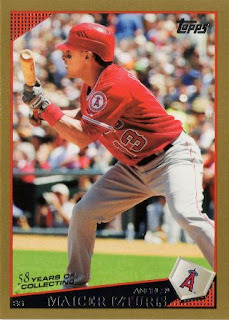 The media and fans will always assume the worst and short of what they really want to call him - Young's already had some history of immaturity, dating back when he threw a bat at an umpire in the minors, so anyone with Google will find all sorts of stuff said about him you wouldn't say to his face. Even if Young has been a disappointment under most circumstances as a former No. 1 overall pick - he is still a professional baseball player with some stature, one who needs to get some help before he finds himself completely irrelevant. 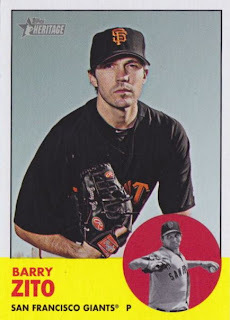 Barry Zito has enjoyed a string of resurgent starts in the first month of the 2012 season - its not like I've followed his playing career religiously, but I remember him as part of the 'Big Three' [with Tim Hudson and Mark Mulder] for the Oakland Athletics back in the early 2000's. Since he's been with the Giants, Zito's either been a sore free-agent disappointment or pitched as well as a No. 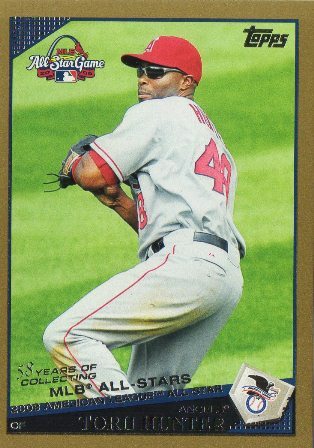 4 starting pitcher can - while being paid as a No.1. I do want to say while he always had a sort of unique persona off the field - it was moving to see his relationship with his ailing father in last season's Showtime documentary about the San Francisco Giants. Minnesota Twins fan and card blogger Rhubarb_Runner saw my 2012 Topps Tribute pack break on my blog and wanted the Joe Mauer base card - he wanted to do a bigger deal though I was stumped, wondering what other card I really have for trade? 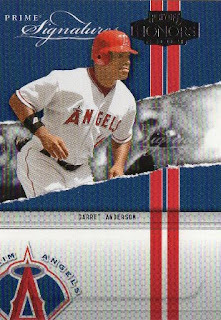 MAYBE THIS SITUATION ILLUSTRATES HOW I CAN USE MY INSERT DATABASE THAT I'VE WORKED ON - I sorted my database of inserts to look for Twins cards and actually found some trade bait. I put together a list and was eager to see if there was any interest in the cards I rounded up - apparently there was interest and after thinking about the cards I was actually going to be sending and what I was getting back, I relented to get something done. 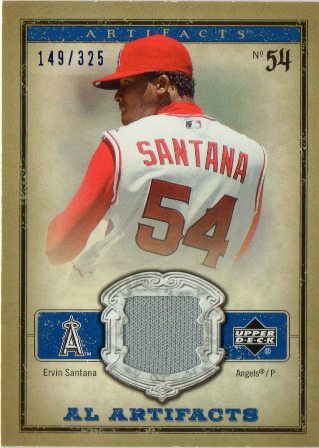 I got jersey / memorabilia cards [of Ervin Santana and Howie Kendrick], a 2008 Topps Heritage Chrome refractor of Mike Napoli and a handful of Angels inserts and serial #'d cards - some nice cards to add to the collective. I wasn't expecting to get every current Angels player autograph, but 2012 Angels Fan Fest seemed like a disappointment because not every current player actually made an appearance to sign autographs - assuming I have something to get signed in the first place, the experience to watch paint dry in line before getting a couple of random autographs wasn't too bad for $5, but even guys Jered Weaver, Torii Hunter, Mark Trumbo didn't sign. 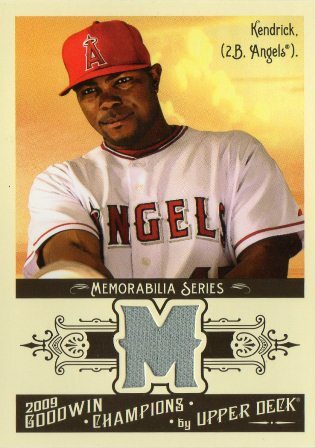 Anyways, there maybe other ways to get current Angels autographs over the course of the season, even Albert Pujols- some opportunities may cost more than $5, most opportunities come by going to a game or waiting hours before [or after] and it is what it is when the Angels put on an event like the Fan Fest for the general public. My game plan was to try and get a couple of current Angels players, though with the way things are set up, the public isn't told which specific players is going to signing at any particular table - I was hoping to run into a 'decent' Angels player regardless of when I finally got up to the tent / table were players [two at a table] signed. 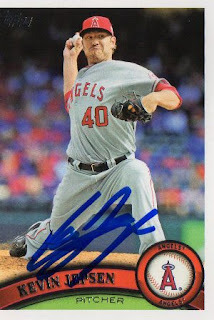 Maybe two hours and 30 minutes later, I got my first two autographs - I was among the last several people to get an autograph of a couple of Angels relievers. 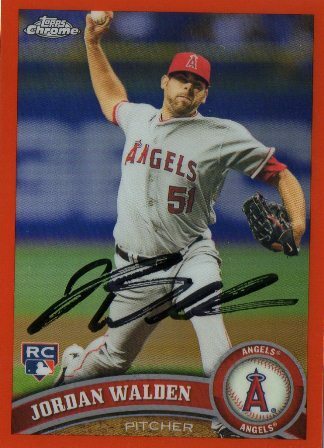 Jordan Walden (1) - I threw my card out past the lady ahead of me in line [there was literally a few minutes left and it seemed like she wasn't paying attention] and Walden signed my card, though he used his own black Sharpie and the autograph streaked. 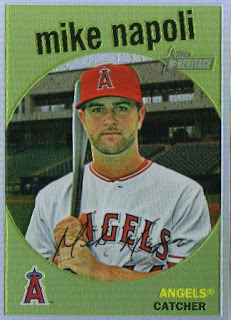 I didn't prep the 2011 Topps Chrome Orange parallel card down and took a chance it would be signed cleanly - it wasn't clean, though I'll probably keep it instead of trying to remove the autograph. Scott Downs (1) - seems like an approachable guy who you can say a little something to and he'd respond back. I asked security if there was only going to be one session of current Angels signing - the guy said it would be, but then Angels alumni would be signing through the next section. 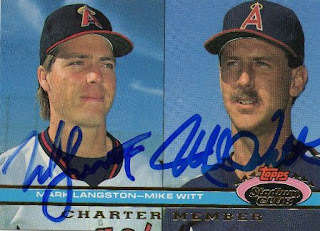 Got back in a line and maybe having some the retired Angels players sign saved the event from being completely useless - there was Clyde Wright, Mike Witt, Chuck Finley, Jim Abbott and Garret Anderson signing. I was in the line where Jim Abbott ended up, but jumped over to the line for GA - who was a notorious 'non signer' when he was an active player with the Angels in his prime. I got several GA cards from a trade a few days ago - he also threw out the first pitch [to the Angels equipment manager who won the Baseball I.Q. game show on MLB Network] before Friday's game. With the cards I traded for staring me in the face and him being at the stadium recently - maybe it a clue I'd better bring a few of those cards as well as dig out my unsigned 2008 Topps Allen and Ginter 'setter' in case he shows up. Anderson (1) - had him sign my 2008 Topps Allen and Ginter. I guess it's not really sad, but it seemed like just several years ago where he was an active player - now GA's hair has some gray and nearly 40 years old, he's trotted out as an Angels retired alumni. Witt (1) - there was only a couple of minutes left before the alumni were going to be herded from the tables to conclude the signings. The cute handler standing next to Witt got the word from her boss and was really watching the clock tick down - it came down to the wire, but I was able to get my 1991 Toppps Stadium Club Charter Members dual card completed. 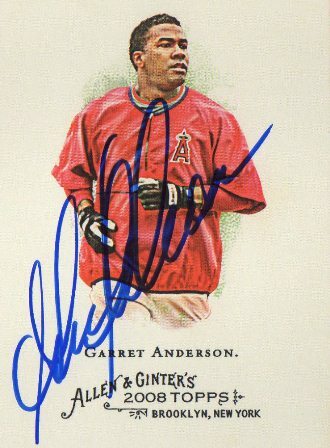 I wanted the card signed since Mark Langston just signed it on Friday [a card another collector helped me get signed] - I figured to get it done now or else I may have to wait a while for the next time Witt makes an appearance. 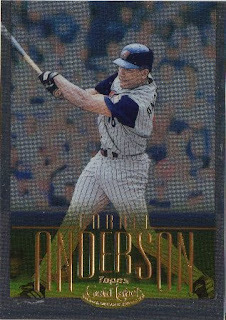 Dangling in the wind was my 1985 Topps Super card I bought for a quarter at a card shop - like the Anderson cards, it kind of stared back at me the night before as I'm putting my binders / cards together. I thought it wouldn't hurt to bring it to Angels Fan Fest - just so if Witt showed up, I'd actually get it signed. I didn't know what I was going to do, but on foot I sort of followed the golf carts transporting the five alumni and maybe some Angels handlers / employees on foot - it looked like they were heading back to the team offices. When I got towards the offices, I saw Witt was actually leaving - I lumbered towards Witt getting into his SUV. 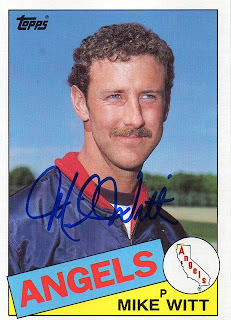 Witt (1) - he signed my 1985 Topps Super and he casually points out, "aren't you causing that alarm to go off?" I must have tripped the alarm of the vehicle I bumped against as I'm getting Witt to sign - I thank him as I try to back away and collect my thoughts. 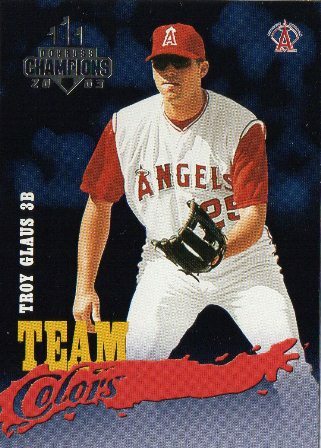 I didn't have a ticket to Sunday's game but was planning on sticking around to see if I can get postgame autographs from the Angels - my friend was going to do the same thing and said he was pooped out to do anything [like go to Lake Elsinore as he had originally planned] but sleep in his car [for at least a couple of hours]. I was hanging out in the back for about an hour after the game - Pujols didn't sign, though Angels manager Mike Scioscia signed a handful through the fence before he had to go. It wasn't worth trying to wade into the clustermuck of people trying to hand stuff through the Angels' parking structure just to get a Scioscia scribble. 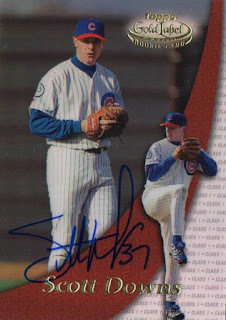 Kevin Jepsen (1) - I thought it could have been C.J. Wilson or Downs who relented to stop and sign until I saw an autograph Jepsen signed for a boy. 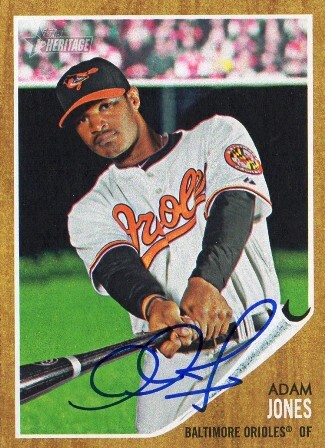 Adam Jones c/o Baltimore Orioles [spring training] - I sent an autograph request to the Orioles' centerfielder on 2/25 and got a SASE back with one card signed in blue ink on 4/7/12. 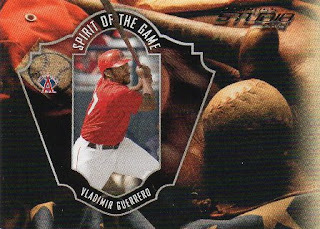 The other card I sent wasn't returned [an 2011 Donruss Elite Extra Edition]. 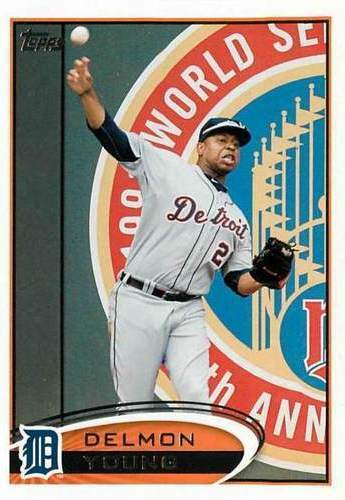 I only sent 10 spring training requests in 2012 and the only other response was on 3/8/12 - when I got a 'return to sender' for a request I sent to Detroit Tigers prospect Jacob Turner.